What blood type am I? What blood type will my baby have? If you've ever wondered what a blood type is, or what blood type will your baby have, make sure to check out this blood type calculator. You will be able to check what are the possible blood types for you child based on the information about the parents. Additionally, in this article, you will find a handy table that explains how the blood groups of donors and recipients influence the option of blood transfusion. Are you currently expecting a baby? Take a look at the pregnancy weight gain calculator! There are four main groups of blood: A, B, AB and 0. Each of them contains different antigens (such as carbohydrates or proteins) on the membrane of red blood cells. Depending on the presence or absence of these antigens, as well as on the presence of specific antibodies in the blood plasma, it is possible to find out which blood group your blood belongs to. Alleles A and B are dominant, and the allele 0 is recessive. It means that only people with 00 alleles can have the blood type 0. Our calculator takes into consideration an additional classification that divides blood into two groups: Rh+ and Rh-. They also describe the presence or absence of a particular antigen - in this case, the Rh(D) antigen. The negative allele is recessive, what means that two parents with a blood type Rh- will always have children with Rh- blood. Write down your blood type and accompanying alleles. As your blood group is A, you either have AA or A0 alleles. Your child will either inherit an A allele (75% chance) or 0 allele (25% chance). Write down your partner's blood type and accompanying alleles. As their blood group is AB, he has the genotype of AB. Your child will either inherit an A allele (50% chance) or B allele (50% chance) from your partner. The chance that your child's genotype is AA is 75% * 50% = 37.5%. The chance that your child's genotype is AB is 75% * 50% = 37.5%. The chance that your child's genotype is A0 is 25% * 50% = 12.5%. The chance that your child's genotype is B0 is 25% * 50% = 12.5%. Add the results for AA and A0 together. Do the same for the results for BB and B0. The chance for A blood group is 37.5% + 12.5%' = 50%. The chance for B blood group is 12.5%. The chance for AB blood group is 37.5%. If both parents are Rh-positive, then there's a 93.75% chance for an Rh+ and 6.75% chance for an Rh- blood type. If both parents are Rh-negative, then there's a 100% chance for an Rh- blood type. 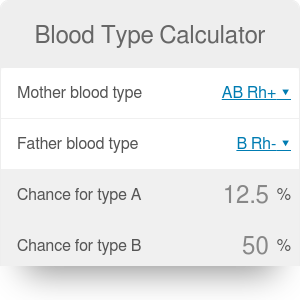 If one parent is Rh-positive and the other Rh-negative, then there's a 75% chance for an Rh+ and 25% chance for an Rh- blood type. Because of the existence of blood types, not every person's blood can be transferred to a person in need. We even created a separate blood donor calculator to help you avoid confusion when donating or receiving blood! A person with an AB blood type can receive blood from everyone else, but can only donate blood for other individuals with AB type. A person with an A or B blood type can receive blood from everyone except AB, and can donate blood to other individuals with the same type. They can also donate blood to people with type AB. A person with a 0 blood type can receive blood only from individuals with the same blood type. However, they can donate blood to individuals with all blood types. A person with an Rh+ blood type can donate only to individuals with Rh+ blood type, but can receive blood from both Rh+ and Rh-. A person with an Rh- blood type can donate to individuals with both Rh+ and Rh- blood types, but can receive blood only from Rh-. These rules are summarized in the table below. Blood Type Calculator can be embedded on your website to enrich the content you wrote and make it easier for your visitors to understand your message.